Allergic rhinitis (AR), the most common chronic disease in childhood is often ignored, misdiagnosed and/or mistreated. Undertreated AR impairs quality of life, exacerbates asthma and is a major factor in asthma development. It can involve the nose itself, as well as the organs connected with the nose manifesting a variety of symptoms. Evidence-based guidelines for AR therapy improve disease control. Recently, paediatric AR guidelines have been published by the European Academy of Allergy and Clinical Immunology and are available online, as are a patient care pathway for children with AR and asthma from the Royal College of Paediatrics and Child Health. Management involves diagnosis, followed by avoidance of relevant allergens, with additional pharmacotherapy needed for most sufferers. This ranges, according to severity, from saline sprays, through non-sedating antihistamines, oral or topical, with minimally bioavailable intranasal corticosteroids for moderate/severe disease, possibly plus additional antihistamine or antileukotriene. The concept of rhinitis control is emerging, but there is no universally accepted definition. Where pharmacotherapy fails, allergen-specific immunotherapy, which is uniquely able to alter long-term disease outcomes, should be considered. The subcutaneous form (subcutaneous immunotherapy) in children has been underused because of concerns regarding safety and acceptability of injections. Sublingual immunotherapy is both efficacious and safe for grass pollen allergy. Further studies on other allergens in children are needed. Patient, carer and practitioner education into AR and its treatment are a vital part of management. Rhinitis, which can be allergic, infectious or neither of these, is defined as at least two nasal symptoms, including rhinorrhoea, blockage, sneezing and itching. It is a common problem in childhood and adolescence which impacts negatively on physical, social and psychological well-being. Allergic rhinitis (AR) is an under-recognised inflammatory condition of the nasal mucosa, caused by immunoglobulin E (IgE)-mediated early-phase and late-phase hypersensitivity responses, usually to inhalant allergens, similar to those in allergic asthma.1–3 Typical allergens include house dust mite, grass and tree pollens, dander from animals such as cat, dog, horse and, occasionally, moulds.4 Different phenotypes exist; those with obvious symptoms of sneezing and running, who are easily recognised, and others with predominant blockage, where the diagnosis may be missed. Children with AR can present with symptoms related to nasal connections, such as lungs, throat, ears, (table 1) or to quality-of-life impairment, often related to poor quality sleep and consequent fatigue, poor concentration and school performance. Guideline-directed management has been shown to improve disease control.30 The global Allergic Rhinitis and its Impact on Asthma guideline (ARIA),1 which includes quality-of-life measures in evaluation and treatment, and provides an evidence-based approach to treatment of AR, has recently been updated using GRADE (Grading of Recommendations, Assessment, Development and Evaluations) methodology.31 The UK has its own guidelines, which are currently being updated.32 More recent, specifically paediatric guidelines, include those from the European Academy for Allergy and Clinical Immunology (EAACI)33 and patient pathways from the Royal College of Paediatrics and Child Health.34 The following is a synopsis of their content. AR is diagnosed by detailed history, including questions about possible asthma, and nasal examination, together with inspection of throat, ears and chest where possible, backed up by specific allergy tests, either skin prick or blood tests, for specific IgE to allergens suggested by the history. Clinical history: symptom type, duration and frequency and exacerbating factors are the cornerstone for diagnosing and classifying paediatric rhinitis which is characterised by two or more nasal symptoms: itching, sneezing, obstruction and rhinorrhoea. The timing of these in relation to exposure to allergen (ie, specific season or animal) is highly relevant. Upon such exposure, symptoms of AR occur in minutes and last for hours. Late-phase symptoms can include nasal obstruction, hyposmia, postnasal mucous discharge and nasal hyper-reactivity.35 AC occurs in approximately 50%–70% of patients with AR6 and is the symptom which best differentiates AR from other forms of rhinitis. Pan airway involvement should be considered, both in the history and on examination. Rhinitis has many underlying causes. (table 2). Approximately two-thirds of children and one-third of adult patients with rhinitis will present with AR; the remainder have other forms and some defy classification (idiopathic rhinitis).1 Recurrent viral colds are more frequent in small children; AR is more common in older ones. Unilateral symptoms, nasal obstruction without other symptoms, mucopurulent discharge, pain or recurrent epistaxis suggest other diagnoses including rarer conditions that can mimic AR.35 Chronic unremitting rhinitis present from birth should lead to tests for primary ciliary diskinesia. One-sided persistent nasal blockage, especially with purulent discharge, suggests a foreign body or unilateral choanal atresia. Watery discharge from one side of the nose, especially on bending forward, can represent a cerebrospinal fluid leak. Cystic fibrosis should be sought if nasal polyps are found. Oral contraceptives can cause rhinitis in adolescents. Confirmation of the diagnosis of AR requires evidence of specific IgE reactivity to airborne allergens relevant to the history via either skin-prick testing or the demonstration of serum-specific IgE. This information is also relevant to environmental control measures and allergen-SIT. Immediate hypersensitivity skin testing provides results within 15 min of performing skin tests, whereas blood tests for specific IgE take days and may be less cost-effective than skin-prick testing, but are useful in patients with dermatographism, severe atopic dermatitis or those unable or unwilling to temporarily stop antihistamine use. All IgE test results must be interpreted in the light of the history since both false negative and false positive (sensitisation without clinical disease) tests occur.29 ,42 ,43 AR is triggered mainly by inhalant allergens, of which house dust mites, grass and tree pollens are the most common in most parts of the world.5 It should be noted that an isolated positive IgE test with no relevant symptoms represents sensitisation and not clinical disease and does not require treatment; therefore, ‘fishing expeditions’, in which multiple allergy tests are undertaken, are not recommended. If IgE tests are unavailable, then a possible alternative is a trial of antiallergy therapy using an intranasal corticosteroid or antihistamine or both. Other tests measuring nasal patency and lung function may be helpful. The latter should always be done in persistent rhinitis or where there are any chest symptoms. This aims at safe and effective symptom relief plus prevention of complications and disease progression. There is evidence that outcomes are improved when evidence-based guidelines are applied.31 The ARIA guidelines are currently the most widely used in Europe for AR treatment. A recent revision published in 2010 answers specific paediatric questions.32 The EAACI guideline similarly suggests a stepwise therapeutic approach (figure 2). Entry to therapy can occur at 1, 2 or 3 year, depending on severity of presenting symptoms. Poor control should lead to a step up, good control to a step down, so that the minimum therapy necessary is used. For seasonal disease, regular therapy should be commenced 2 weeks before the anticipated start of symptoms. *Oral antihistamines may be better tolerated, while intranasal antihistamines have a more rapid onset of action. **Reconsider diagnosis if not controlled within 1–2 weeks. If <2 years of age and unresponsive to antihistamine within a week, reconsider diagnosis before stepping up therapy. If poorly controlled, consider a short rescue course of a decongestant or low-dose oral prednisolone to gain symptom control; topical ipratropium may be useful for rhinorrhoea (adapted from Roberts et al  (with permission)). Allergen avoidance, where possible, is recommended across the spectrum of disease severity. Those suffering from hay fever are asymptomatic outside the pollen season and symptoms in nose and eyes are reduced by nasal air filters,44 and pet avoidance shows clear benefits; for house dust mite (HDM) reduction, individual measures gave equivocal results or lack of benefit.45 FA rarely causes isolated rhinitis, but can be relevant where there are additional gastrointestinal problems, asthma and/or atopic eczema in toddlers. New-generation, non-sedating, antihistamines are recommended alone for mild to moderate AR and in combination with INS for moderate to severe disease.47 Sedating antihistamines, all of which cause psychomotor retardation, should no longer be used.48 Intranasal antihistamine alone is faster in onset (15 min, compared with 1 h) and is more effective on nasal symptoms than oral antihistamines49 and is underused. INS are superior, for all symptoms, (excluding eye symptoms for which they are equal) to antihistamines (oral or topical), to antileukotrienes and to the combination of antihistamine and antileukotriene in meta-analyses.50–52 In particular, they are more effective in relieving nasal obstruction.50 INS are recommended for moderate to severe disease; concerns relating to systemic effects are unfounded when the latest molecules are used, as their systemic bioavailability is extremely low (figure 3). Mometasone furoate and fluticasone proprionate have been extensively studied in children, and no adverse effects on cortisol levels, the hypothalamic-pituitary-adrenal axis or growth over 1 year have been detected,53 ,54 unlike beclamethasone.55 Fluticasone furoate, similarly, has low bioavailability, but the use of a double-dose 110 mcg per day has been associated with reduction in growth.56 It is sensible to use the lowest dose of minimally bioavailable INS needed to maintain control and to administer this in the morning. ‘Holidays’ from treatment are ineffective in reduction of systemic effects and are liable to result in loss of control. Regular monitoring of growth is a sensitive marker for systemic effects and is sensible, particularly in children receiving corticosteroids to skin, lung and nose. The contribution to systemic effects is greater from skin than lung, with very little from the nose compared with skin or lung, so if growth is slowed, attempts to reduce those areas of treatment should be made first. Considering the adverse impact of uncontrolled rhinitis upon asthma, it may be possible to reduce or even stop inhaled corticosteroids once INS are started, since INS may reduce ocular symptoms and also bronchial hyper-reactivity, probably by reduction of inflammation-induced neural reflexes,57 at which recently available molecules such as fluticasone furoate appear more consistently effective.58 There is some evidence that INS can benefit asthma,17 ,59–61 but randomised, controlled prospective trials are needed of the addition of long-term INS to regular inhaled corticosteroids, both for efficacy and safety. It is logical to treat AR and asthma as one with a corticosteroid inhaled via the nose. Attempts have been made,62 ,63 but the practice has not yet been accepted. Systemic bioavailability of intranasal steroids. It is vital to explain the safety and correct use of INS to children and their carers. The delay in onset of action should be explained, plus the need for regular treatment, how to administer the spray (figure 4) and linking use to a regular daily activity, such as teeth cleaning. Provision of contact details for advice should also aid concordance, since well-meaning uninformed relatives, friends and even primary care practitioners may state that temporary use is all that is allowed, or may switch the prescription to an older, cheaper, more bioavailable molecule. (A) shows how to use a nasal spray so as to avoid the septum and spray as much of the lateral wall mucosa as possible, allowing subsequent mucociliary clearance to distribute the liquid all over the mucosa. 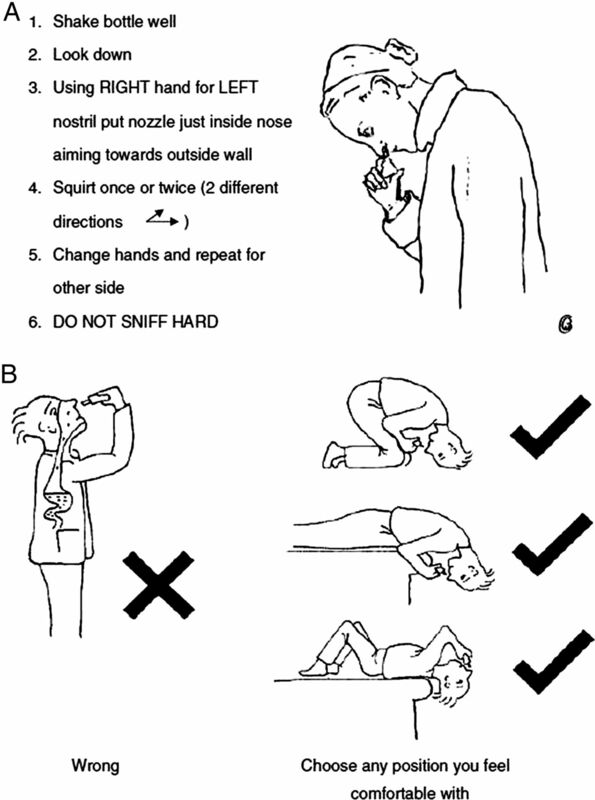 (B) shows how nasal drops (superior for rhinosinusitis) should be used with the head completely upside down so that drops reach the ostiomeatal complex in the upper nose where sinuses drain and ventilate (adapted from Scadding et al  (with permission)). Nasal biopsies do not show mucosal atrophy after 1 year of regular INS use in adults.64–66 INS improve mucociliary clearance, and have shown benefits when used in acute rhinosinusitis, so continuation during viral colds is recommended. A combined nasal spray containing fluticasone propionate and azelastine, an antihistamine, is under trial for use in children. Leukotriene receptor antagonists have similar effects as oral antihistamines, with minimal additional benefit when the two are used in combination.33 ,68 Use in children with seasonal AR, in preschool children with persistent AR and in children with AR and concomitant asthma, where concerns exist about the use of glucocorticoids, is suggested by ARIA 2010. Benefits of therapy must always be weighed against risks. A recent review of UK SIT practice72 confirmed a low incidence of severe adverse reactions and no fatalities, even though guidelines about excluding chronic asthma subjects were not observed, and patients with chronic asthma were treated with SIT. Adrenaline injections are still sometimes needed for anaphylaxis in SCIT which, because it is not completely risk-free, must only be administered by those competent in its use. Concordance with long-term therapy, like SIT, is challenging: good contact and communication are again necessary. AR is worth treating effectively, even when it is part of a myriad of allergic conditions; as the nose is the gateway to the respiratory tract, good rhinitis control can facilitate control of symptoms elsewhere. AR, if poorly controlled, results in troublesome symptoms and impacts on daily activities, quality of life and on other areas of the respiratory tract, such as ears, sinuses, throat and lungs. Possible causes for difficult-to-treat cases include doctor factors such as misdiagnosis and undertreatment or patient factors such as lack of concordance with therapy. This can be reduced by information leaflets on specific allergen avoidance, the correct technique in the application of nasal preparations (avoiding the septum and leaving in place rather than sniffing back) and explanation of potential side effects. Clearly written treatment plans are useful, particularly if several preparations are prescribed. AR can sometimes copresent in association with other forms of rhinitis (or rhinosinusitis) leading to increased severity (mixed rhinitis). Associated comorbidities should be considered in the differential diagnosis in order to determine the most appropriate therapeutic approach. Allergen-SIT should be considered for patients with genuinely difficult-to-control allergic disease, despite guideline-directed pharmacotherapy properly taken. Grade A evidence via meta-analysis confirms its efficacy and it is unique in its ability to alter the long-term disease course.
. BSACI guidelines for the management of allergic and non-allergic rhinitis. Clin Exp Allergy 2008;38:19–42.
. Allergic Rhinitis and its Impact on Asthma (ARIA) 2008 update (in collaboration with the World Health Organization, GA(2)LEN and AllerGen). Allergy 2008;63(Suppl 86):8–160.
. Global map of the prevalence of symptoms of rhinoconjunctivitis in children: The International Study of Asthma and Allergies in Childhood (ISAAC) Phase Three. Allergy 2009;64:123–48.
. Worldwide time trends for symptoms of rhinitis and conjunctivitis: Phase III of the International Study of Asthma and Allergies in Childhood. Pediatr Allergy Immunol 2008;19:110–24.
. GA(2)LEN skin test study II: clinical relevance of inhalant allergen sensitizations in Europe. Allergy 2009;64:1507–15.
. Rhinitis in children: co-morbidities and phenotypes. Pediatr Allergy Immunol 2010;21(4 Pt 1):612–12.
. Children with allergic and nonallergic rhinitis have a similar risk of asthma. J Allergy Clin Immunol 2010;126:567–7.
. Lack of control of severe asthma is associated with co-existence of moderate-to-severe rhinitis. Allergy 2008;63:564–9.
. High prevalence and young onset of allergic rhinitis in children with bronchial asthma. Pediatr Allergy Immunol 2008;19:517–22.
. Allergic rhinitis is associated with poor asthma control in children with asthma. Thorax 2012;67:582–7.
. Prevalence of allergic rhinitis and its impact on the use of emergency care services in a group of children and adolescents with moderate to severe persistent asthma. J Pediatr (Rio J) 2007;83:555–61.
. Minimal persistent inflammation in allergic rhinitis: implications for current treatment strategies. Clin Exp Immunol 2009;158:260–71.
. Allergic patients have more numerous and prolonged respiratory infections than non-allergic subjects. Allergy 2007;62:1087–90.
. Study of modifiable risk factors for asthma exacerbations: virus infection and allergen exposure increase the risk of asthma hospital admissions in children. Thorax 2006;61:376–82.
. Childhood allergic rhinitis predicts asthma incidence and persistence to middle age: a longitudinal study. J Allergy Clin Immunol 2007;120:863–9.
. Bronchial hyperresponsiveness in pediatric rhinitis patients: The difference between allergic and nonallergic rhinitis. Am J Rhinol Allergy 2013;27:63–8.
. Impact of intranasal corticosteroids on asthma outcomes in allergic rhinitis: a meta-analysis. Allergy 2013;68:569–79.
. Effect of treating allergic rhinitis with corticosteroids in patients with mild-to-moderate persistent asthma. Chest 2005;128:3140–7.
. Specific immunotherapy has long-term preventive effect of seasonal and perennial asthma: 10-year follow-up on the PAT study. Allergy 2007;62:943–8.
. Quality of life in children and adolescents with allergic rhinitis. Braz J Otorhinolaryngol 2009;75:642–9.
. Burden of allergic rhinitis: results from the Pediatric Allergies in America survey. J Allergy Clin Immunol 2009;124(3 Suppl):S43–70.
. Impairment in quality of life is directly related to the level of allergen exposure and allergic airway inflammation. Clin Exp Allergy 2005;35:1295–300.
. Psychological stress and family functioning in mothers of children with allergic rhinitis. Int J Pediatr Otorhinolaryngol 2009;73:1795–8.
. Allergic rhinitis and its effect on sleep, fatigue, and daytime somnolence. Ann Allergy Asthma Immunol 2006;97:579–86.
. Allergic rhinitis and impairment issues in schoolchildren: a consensus report. Curr Med Res Opin 2004;20:1937–52.
. Seasonal allergic rhinitis is associated with a detrimental effect on examination performance in United Kingdom teenagers: case-control study. J Allergy Clin Immunol 2007;120:381–7.
. Assessment of quality of life in adolescents with allergic rhinoconjunctivitis: development and testing of a questionnaire for clinical trials. J Allergy Clin Immunol 1994;93:413–23.
. Seasonal allergic rhinitis and antihistamine effects on children's learning. Ann Allergy 1993;71:121–6.
. The natural history of allergic rhinitis in childhood. Pediatr Allergy Immunol 2010;21:962–9.
. Local allergic rhinitis: a new entity, characterization and further studies. Curr Opin Allergy Clin Immunol 2010;10:1–7.
. Implementation of guidelines for seasonal allergic rhinitis: a randomized controlled trial. Allergy 2003;58:733–41.
. Allergic Rhinitis and its Impact on Asthma (ARIA) guidelines: 2010 revision. J Allergy Clin Immunol 2010;126:466–76.
. Paediatric rhinitis: position paper of the European Academy of Allergy and Clinical Immunology. Allergy 2013;68:1102–16.
. The ‘unified airway’: the RCPCH care pathway for children with asthma and/or rhinitis. Arch Dis Child 2011;96(Suppl 2):i10–14.
. Allergic Rhinitis. Lancet 2011;378:2112–22.
. Non-surgical treatment of adenoidal hypertrophy: the role of treating IgE-mediated inflammation. Pediatr Allergy Immunol 2010;21:1095–106.
. EPOS 2012: European position paper on rhinosinusitis and nasal polyps 2012. A summary for otorhinolaryngologists. Rhinology 2012;50:1–12.
. The prevalence of atopic disorders in children with chronic otitis media with effusion. Pediatr Allergy Immunol 2001;12:102–6.
. The oral allergy syndrome: improved diagnostic and treatment methods. Curr Opin Allergy Clin Immunol 2005;5:267–3.
. Validation of ARIA (Allergic Rhinitis and its Impact on Asthma) classification in a pediatric population: the PEDRIAL study. Pediatr Allergy Immunol 2011;22:388–92.
. Quantitative assessment of allergic shiners in children with allergic rhinitis. J Allergy Clin Immunol 2009;123:665–71, 671.
. Local IgE synthesis in allergic rhinitis and asthma. Curr Allergy Asthma Rep 2002;2:231–8.
. ‘Entopy’: localized mucosal allergic disease in the absence of systemic responses for atopy. Clin Exp Allergy 2003;33:1374–9.
. The reduction of rhinitis symptoms by nasal filters during natural exposure to ragweed and grass pollen. Allergy 2005;60:529–32.
. Methods and effectiveness of indoor environmental control. Ann Allergy Asthma Immunol 2001;87:44–7.
. Nasal saline irrigation facilitates control of allergic rhinitis by topical steroid in children. ORL J Otorhinolaryngol Relat Spec 2009;71:50–5.
. Histamine and H1-antihistamines: celebrating a century of progress. J Allergy Clin Immunol 2011;128:1139–50.
. Risk of first-generation H1-antihistamines: a GA2LEN position paper. Allergy 2010;65:459–66.
. Evidence-based strategies for treating allergic rhinitis.Curr. Allergy Asthma Rep 2004;6:439–46.
. Intranasal corticosteroids versus oral H1 receptor antagonists in allergic rhinitis: systematic review of randomised controlled trials. BMJ 1998;317:1624–9.
. Intranasal corticosteroids versus topical H1 receptor antagonists for the treatment of allergic rhinitis: a systematic review with meta-analysis. Ann Allergy Asthma Immunol 2002;89:479–84.
. Combination therapy in the treatment of allergic rhinitis. Allergy Asthma Proc 2002;23:1–3. Review.
. No growth suppression in children treated with the maximum recommended dose of fluticasone propionate aqueous nasal spray for one year. Allergy Asthma Proc 2002;23:407–13.
. Absence of growth retardation in children with perennial allergic rhinitis after one year of treatment with mometasone furoate aqueous nasal spray. Pediatrics 2000;105:E22.
. Detection of growth suppression in children during treatment with intranasal beclomethasone dipropionate. Pediatrics 2000;105:E23.
. Growth velocity reduced with once—daily Fluticasone furoate nasal spray in prepubescent children with perennial allergic rhinitis. JACI Pract 2014;2:421–7.
. Nasal ocular reflexes and eye symptoms in patients with allergic rhinitis. Ann Allergy Asthma Immunol 2008;100:194–9.
. Are intranasal corticosteroids all equally consistent in managing ocular symptoms of seasonal allergic rhinitis? Curr Med Res Opinion 2009;25:2021–41.
. Intranasal steroids and the risk of emergency department visits for asthma. J Allergy Clin Immunol 2002;109:636–42.
. Treating allergic rhinitis in patients with comorbid asthma: the risk of asthma-related hospitalizations and emergency department visits. J Allergy Clin Immunol 2002;109:57–62.
. Rhinitis therapy and the prevention of hospital care for asthma: a case-control study. J Allergy Clin Immunol 2004;113:415–19.
. Nasal inhalation of budesonide from a spacer in children with perennial rhinitis and asthma. Allergy 1998;53:383–7.
. Obtaining concomitant control of allergic rhinitis and asthma with a nasally inhaled corticosteroid. Allergy 2007;62:310–16.
. A 1-year placebo-controlled study of intranasal fluticasone propionate aqueous nasal spray in patients with perennial allergic rhinitis: a safety and biopsy study. Clin Otolaryngol Allied Sci 1998;23:69–73.
. Assessment by nasal biopsy of long-term use of mometasone furoate aqueous nasal spray (Nasonex) in the treatment of perennial rhinitis. Otolaryngol Head Neck Surg 1998;118:648–54.
. Long-term safety of budesonide nasal aerosol: a 5.5-year follow-up study. Clin Allergy 1988;18:253–9.
. Lesson of the week: Depot corticosteroid treatment for hay fever causing avascular necrosis of both hips. BMJ 2001;322:1589–91.
. Leukotriene receptor antagonists for allergic rhinitis: a systematic review and meta-analysis. [Review] [44 refs]. American Journal of Medicine 2004;116:338–44.
. Perspectives on allergen-specific immunotherapy in childhood: An EAACI position statement. Pediatr Allergy Immunol 2012;23:300–6.
. Immunotherapy for allergic rhinitis. 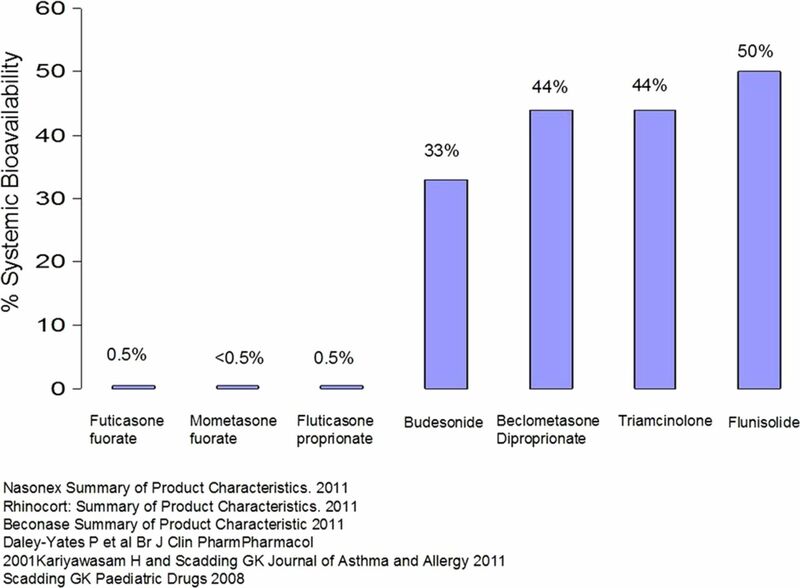 Clin Exp Allergy 2011;41:1177–200.
. Specific immunotherapy in children. Clin Exp Allergy 2011;41:1256–62.
. A national audit of pollen immunotherapy for children in the United Kingdom: patient selection and programme safety. Clin Exp Allergy 2011;41:1313–23.
. Allergen immunotherapy and health care cost benefits for children with allergic rhinitis: a large-scale, retrospective, matched cohort study. Ann Allergy Asthma Immunol 2010;104:79–85.
. Sublingual immunotherapy in children: complete and updated review supporting evidence of effect. Curr Opin Allergy Clin Immunol 2009;9:168–76.
. Sublingual immunotherapy for allergic rhinitis. Cochrane Database Syst Rev 2010;(12):CD002893. Competing interests Research grants from GSK, ALK. Honoraria for articles, lectures/chairing and advisory boards: Astra Zeneca, Brittania Pharmaceuticals, Capnia, Church & Dwight, Circassia, GSK, Groupo Uriach, Meda, Merck, MSD, Ono Pharmaceuticals, Oxford Therapeutics, Sanofi-Aventis, UCB. Travel funding from Bayer, GSK.